Dickinson Philips are pleased to offer a Laser Profile Cutting & Engraving service. There are pros & cons for this method of manufacturing plastic parts, most of which are detailed below. No gate or ejector pin marks. Great for prototypes and low volume production runs. Parts can also be laser engraved with logos/part number etc. Part price is higher than an injection moulded part. Only suitable for flat profile parts (Although can often be designed for easy post cut assembly). Waste cannot readily be recycled. 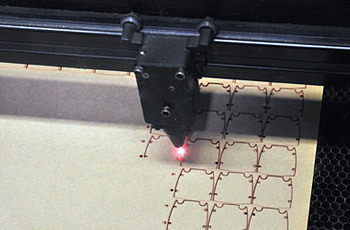 If you would like to know more about our Laser Cutting capabilities, please contact us.